If you would like us to help you with relocating your business, or find out more about Milton's advantages, please contact the Economic Development Office at 905.878.7252 ext. 2107. Nestled between the current and future 401 interchanges is a new Milton distribution Centre currently under construction. The new build-to-suit facility, by Emery Investments is the largest development presently underway in Milton. “Emery Investments chose to build in Milton because of its exploding growth, ease of access and high quality profile,” - Mary Wood, Vice President Leasing, Emery Investments. The 410,000 square foot facility at 8500 Mount Pleasant Way boasts 401 visibility and proximity to the future Tremaine interchange. Zoned M1, this facility is available for a wide range of uses and is divisible for up to two units of approximately 205,000 square feet. To learn more about this and other opportunities visit Milton This Way Up's Real Estate Database. The Escarpment Way Business Park north of Highway 401 will soon welcome a new distribution space. The Healthcare of Ontario Pension Plan's (HOOPP) 248,127 square foot 'Building E' is now under construction. "This is the last piece of HOOPP's development in Milton and they are proud of their success," said Kyle Hanna, Senior Vice President of CBRE Limited. "The strength of the Milton market played a major role in attracting the right tenants and HOOPP is looking forward to further opportunities to develop in Milton." The state-of-the-art facility at 8640 Escarpment Way features M2 zoning (allowing for outdoor storage), flow-through shipping and 32' foot ceilings. The site can also be fully secured. Expected to be ready for occupancy in September 2015, the new tenants will be joining neighbours Sun Products, Transpro Freight, Lowe's, and Medline. For more information on this and other properties available in Milton, visit the Milton This Way Up Real Estate Database. Construction on the Milton District Hospital Expansion is underway. The aggressive 25-month construction schedule will see the existing 125,000 square foot building expand to 455,000 square feet by April 2017, followed by occupancy in the fall. With a focus on patient-centred care, the hospital’s expansion was designed to provide exceptional health services within an innovative hospital environment. 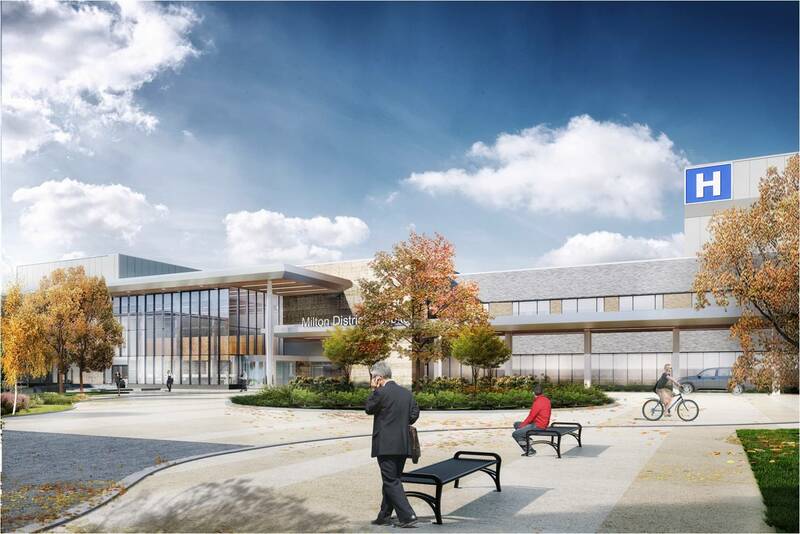 Built to meet the needs of our growing community and accommodate the changing face of healthcare, the expansion at Milton District Hospital will provide Milton residents with improved access to the care they need. The Plenary Health team, selected in January to design, build, finance and maintain the project, will be at the helm of the approximately $512 million expansion. The 330,000-square-foot expansion will allow the hospital to handle approximately 45,000 visits a year with an increase of inpatient beds from 63 to 129. Plans also include the expansion of emergency, surgical services, medical/surgical inpatient units, critical care, maternal newborn and diagnostic imaging, support services, as well as the first magnetic resonance imaging (MRI) machine in Milton. More information and a virtual tour of the new hospital can be found on the HHR website. Small businesses are at the core of Milton’s economy. Over 5,200 local companies have four or fewer employees. This represents over 83% of total businesses in Town. It also represents a tremendous opportunity for the community. The Milton Education Village (MEV) Innovation Centre is a strategic resource dedicated to supporting the growth of high-value businesses. One of the fundamentals of success for small companies is making a good impression with customers and building their business’s reputation. Meeting a client in a coffee shop or tying to dampen the domestic background noise coming from a home office may begin to raise questions about a company’s professionalism and reliability. Fortunately, Milton now has an option to help entrepreneurs create the image they want and deserve. The MEV Innovation Centre is launching a membership option for entrepreneurs. Having an alternative to working from home reduces the isolation faced by many solo entrepreneurs and helps them focus on their pressing projects. For only $100 a month, an annual membership gives small businesses instant and affordable access to a modern and professional facility where they can impress their key clients, make that important pitch, be more productive and bounce ideas off other companies. The MEV Innovation Centre would be happy to tell you more about becoming a member or using the facility for business meetings and events. For more information, call 905-636-6506 or visit MEVInnovationCentre.ca. Beginning this past January, the Milton and surrounding communities have enjoyed the addition of a train on the Milton line. The new train added 1,500 more seats running to Union Station; however, this has placed an even greater burden on parking at the station and revealed gaps in Milton Transit services. In an effort to enhance customer service and provide more travel options to users, Milton Transit has partnered with Metrolinx and RideCo to roll out a year-long pilot project called GO Connect. GO Connect is a pre-booked, door-to-door, dynamic shuttle service connecting riders to and from his/her preferred GO Train at the Milton GO Station. This service supplements current conventional service to enhance transfers with GO Transit and is operated by Milton Transit and local taxis. GO Connect uses mobile app technology from RideCo to reserve, prepay and optimize trips during the morning and evening peak periods. Riders can book their ride through the RideCo app on their Apple or Android device or online at goconnect.rideco.com. The base fare for GO Connect is $1.95 per trip; however, discounts are available for flexible itineraries. For example, the fare may be lowered if the rider is willing to leave a little earlier and/or travel to a nearby pick-up location with other passengers. To learn more about the Go Connect service, visit Milton Transit. Industrial activity started strong in the first quarter of 2015 and projections are looking favourable for the rest of the year. Commercial activity is on par with last year's quarter and should see further development as the year presses on. 1. Monthly Building Report, Town of Milton Planning Department, Month End April 2015. 2. Toronto Real Estate Board, Market Watch Report April 2014, April 2015. 3. Economic Development Office, Town of Milton. 4. Labour Force Characteristics, Seasonally Adjusted, by Census Metropolitan Area 3 Month Moving Average Toronto CMA. March 2014, March 2015. Copyright © 2015 Town of Milton, All rights reserved.